Snohomish Conservation District's Agricultural Resilience Program will help farmers in our county plan for future changes and risk. Are you tired of lawn maintenance? Do you want to learn how to grow food? Put away your mower. The Lawns to Lettuce program may be for you! The Lawns to Lettuce program encourages landowners to convert a portion of their lawn to grow edibles in a way that builds healthy soil, protects pollinators, minimizes pesticide use, reduces runoff and conserves water. Send us photos of your projects! If you’ve replaced a portion (or all) of your lawn with edibles, your example can help encourage others. Email jcrumbley@snohomishcd.org or call 425-377-7028. Help us build our Lawns to Lettuce Facebook community of people interested in growing their own food and sharing their extra produce. Pledge to Plant A Row! Utilize our local food bank map to give away your extra fresh produce. Read our Success Stories and Program Highlights. Thank you for subscribing to receiving Lawns to Lettuce / Project Harvest updates! Our e-newsletter is taking a winter nap and will be back in March 2019. 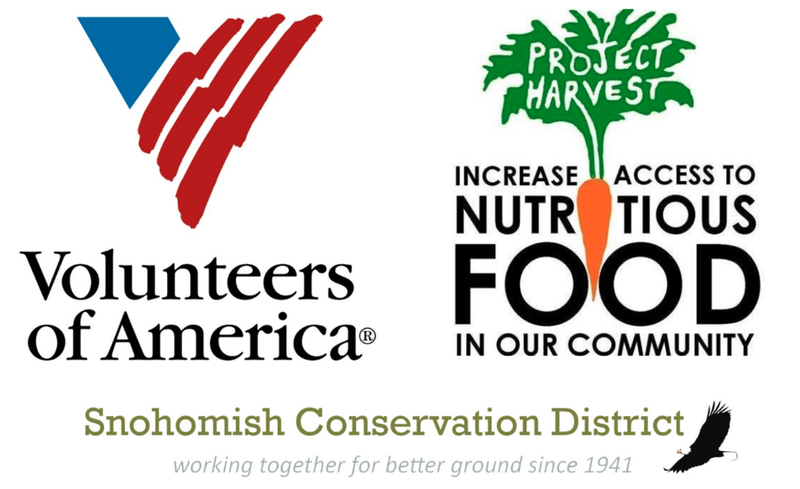 Learn more about our partnership with Volunteers of America's Project Harvest.